GROUND ZER0, New York, N.Y.--Dec. 26, 2003 -- Vigilance is not immune to Mad Cow disease. Our minds can be diseased physically by what we eat, and emotionally by what we think, for thinking Terrorizing Thoughts is not unlike eating infected Mad Cow diseased meat. Unlike incurable Mad Cow disease--the physical form--the Emotional Mad Cow disease is treatable. It can be neutralized with Principles of Vigilance. How can the threat of one's safety from the Beast of Terror and Mad Cow be compared on an equal playing field? Let's take a look at what's happening on the physical side. BSE is not a friendly disease for cows or humans. It chews holes in the brain, making it look like a sponge. If infected, it can take up to 18 months to die. There appears to be no cure as yet. The disease is transferred to humans from eating infected cows. In humans, the infection is called variant Creutzfeldt-Jakob disease, vCJD, as the lingo goes. The disease, it is thought, got its origins from cannibalization. Slaughterhouses ground up the offal--brains, spleens, spinal cords--that wouldn't sell in the butcher shop and fed them to cows. Eating another's brain seems to trigger the disease. Mood swings, numbness and uncontrollable body movements are symptoms of the deadly infection that has killed 80 people in England and three from France so far as part of the European epidemic. Germany, which recently found 25 cows infected, slaughtered 400,000 suspected cows causing 34 countries to ban the import of their beef. Sales of German beef dropped to 50 percent of normal levels. The U.S. federal government has banned blood donations from people who have lived in countries where Mad Cow disease exists. Some of the donors donors include those who have lived more than ten years in France, Portugal or Ireland. People who have lived in Britain for six months or more are on the no-donate list. Other nations where the disease has appeared include Switzerland, Netherlands, Belgium, Luxembourg, Liechtenstein and Denmark. Nature, it seems, has a way of shocking us all into a state of Terror. Whether it is the flu virus, war, or Mad Cow disease, there is an ever-present threat of Mother Nature turning on us and making that McDonald's Big Mac or juicy T-Bone appear to have the makings of a Grim Reaper's scythe. But, Mad Cow disease is a blessing in one sense of the word. It reminds us that ingesting fatal foods can burrow holes in our minds and turn us into babbling, pain-wracked creatures bound for agonizing death without any hope of recovery. If we were to think of our thoughts in the same terms as our caution in eating meat--fearful that if we ate the wrong kind our minds would be shot full of holes--we might not let the Beast of Terror cannibalize our emotional health from the inside out. Think about it. Our brains can be attacked by a disease from a cow and turned into a sponge in months simply by eating the wrong kind of food. Similarly, the Beast of Terror can rip and tear holes in our brains by hacking at the synapses with Fear, Intimidation and Complacency, and render us the "walking dead" just as ferociously as any Mad Cow disease. It all comes down to what we eat. 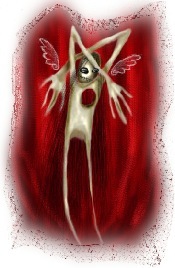 TerrorThoughts are those beliefs, ideas or feelings we harbor that come from the infected brain of the Beast of Terror. The Beast wants us to cannibalize ourselves. If he has one goal, it is to turn a perfectly normal, healthy child into a cowering, fearful, complacent adult, afraid of his or her own shadow. Children who learn from life's brutal experiences that they are vulnerable to emotional attacks cannot defend themselves against the Mad Cow Disease of Terrorism. Take the case of parents tell a child he or she isn't as good as, as smart as, as good looking as, as gifted as other children. Do those thoughts burn holes in a child's brain? Do they disease the child's self image? Cannibalize his or her self worth? Does neglect of a child's Fears, Intimidations and Complacencies eat holes in his or her brain? What about the child whose parents are "too busy" to give them a hug at night, or read them a bedtime story, or to sit and do homework with the child and urge the child to believe he or she can do things that seem insurmountable? What about the wealthy parents who purchase a child all the things one could imagine and yet don't have time to crawl into the child's heart and soul. They are far too concerned with "what others think" than what the child thinks? Does the neglect of a child's Fears, Intimidations and Complacencies invite the Mad Cow Beast to eat holes in the child's brain? To make it think he or she isn't loved enough, cared for enough, thus infecting the child's inner self just a brutally as Mad Cow disease might the physical organs? One quick test any parent or loved one can perform upon a child to see if there is a chance the Mad Cow of Terrorism is eating holes in their child's sense of self, well-being and emotional chemistry is to list down the child's Fears, Intimidations and Complacencies. 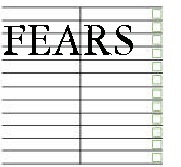 What is your child most fearful of? Physically and emotionally? What is your child most intimidated by? Physically and emotionally? 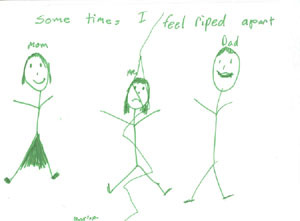 What has your child resigned himself or herself to believing will never happen--at least not to them? More importantly, do you, the parent or loved one, know your own list? Have you identified the Fear, Intimidation and Complacency that may be eating holes daily into your self worth? Do you know the rocks hanging around your neck, the levels of Intimidation you feel toward others, and the degrees of Complacency you have that you'll never, ever be able to do this or that? Odds are, the Fears, Intimidations and Complacencies you hide from yourself are part and parcel of your child's store of them, plus, he or she will have his or her own personal storehouse. Children are mirrors of their parents and guardians. But, they are different. Terrorism is cannibalistic in its purpose. It seeks to eat us alive from the inside out. It hopes our Fear, Intimidation and Complacency will consume us, render us unable to stand up to the Beast and turn us into slaves of our own impotencies. How many parents are willing to share their Fears, Intimidations and Complacencies with their children? Unfortunately, few. So then, how can a parent expect a child to be willing to share his or hers with the parent? When you ask a child, "How are you doing?" and the child answers, "Fine!" 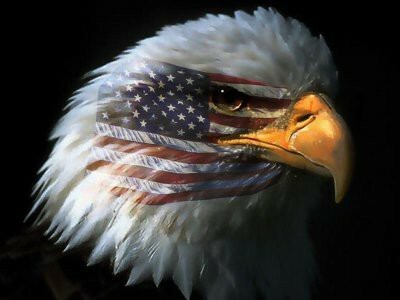 you have asked a question of Complacency. You get an answer that tells you the child believes you don't really want to know how the child feels because you haven't told the child how you feel. Why would anyone tell you how they really felt if you didn't tell them first? The Beast of Terror counts on this cannibalization. Eating one's self up from the inside out is its strategy. Vigilance, on the other hand, denies the silence between lamb and the ewe, between the child and parent. Vigilance says that one must fight Fear with Courage, and Intimidation with Conviction, and Complacency with Right Actions for the Children's Children's Children sake. Vigilance requires that the holes in the soul of the child be repaired daily, that any TerrorThoughts the child receives that wound his or her well-being or threatens self worth be sewn back, sutured by the parent's love and caring for what exists within the child-- this child's being, wholeness, unity with the world and his or her primary purpose. Each of us, adults or children, encounter countless feelings each and every day. As an example, we speak on average some 30,000 words a day. How many thoughts do we think? How many times a day does the Beast of Terror run through our minds with Fear of this or that, Intimidation or Complacency? And, at the end of the day, do we bury those feelings? Do we hide them from others or do we expose them and nurture their ragged edges back to health? 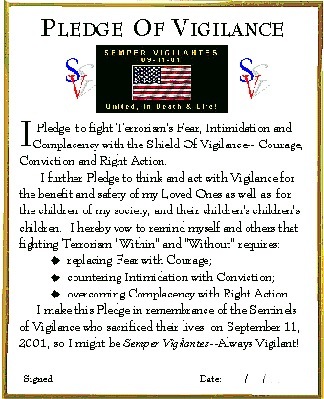 The Pledge of Vigilance provided below is a guideline to inoculating a child and yourself from the Mad Cow disease of Terrorism. It asks us to pledge each and every day to protect our children from the Triads of Terrorism--Fear, Intimidation and Complacency. It asks us to be willing to sit with our child in a quiet moment and share with our child how we used Courage to overcome our Fear, how we applied Conviction to upstage Intimidation and how we fought Complacency by thinking about doing the right thing for the Children's Children's Children. As we share our experiences with our children or loved ones, we repair any holes in the child's mind and soul that may have been cannibalized that day by the Beast of TerrorThoughts. You can be assured each day your child or loved one, just as you experience, has battled the Beast of Terror in many different forms. But, you can't be assured your child has won the daily battle until you climb inside. Mad Cow disease was exposed by examination, by looking inside the animal's tissue, the parts that hold it together. Humans can bridge the gap of ignorance between one another by looking into one another's souls, hearts, feelings and sharing how they can help one another in building fortresses of Vigilance against those notions which depreciate the self. Children who are loved are those whose insides are loved. The outside of us all changes, but the inside remains the same unless we make an effort to change. Leaving ourselves and our children to walk the earth without guarding them against the Beast of Mad Cow ThoughtTerror is as irresponsible as feeding a child lots of meat known to be infected by the disease. Fight the Mad Cow of TerrorThoughts. Become a Parent of Vigilance, a Grandparent of Vigilance, a Loved One of Vigilance. Print, sign and apply the Pledge of Vigilance. And, stay away from meat for a while.